There are just a few weeks left of summer. Before it is over, I want to share with you a few of the highlights of this hot, dry year. I’ll start with July. July started off with a garlic harvest over the Independence Day holiday weekend. I didn’t get the garlic planted under the best of conditions. In fact, it was done in some pretty poor conditions. Half was planted in October, when garlic should be planted here (November is fine for planting, too), but the soil was too wet when we prepared the bed, and it quickly compacted. The other half of the garlic was planted in late February. The soil was just a little bit better then, but it was very late. I wasn’t sure if it would have enough time to grow to nice sized heads. The ripper: it works to dig garlic! To my surprise, the garlic did quite well, even the ones planted late. It was ready to harvest early, thanks to the warm weather. 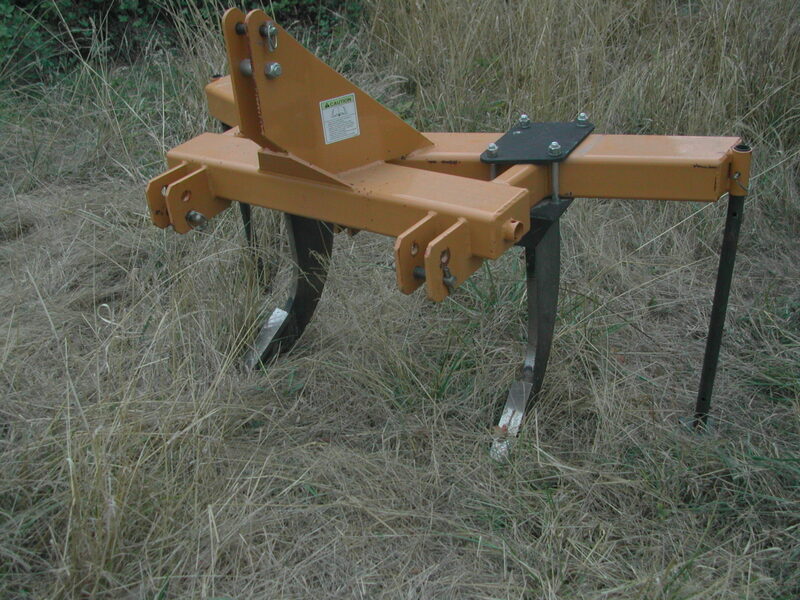 But, by that time, the soil was bone dry and rock hard from the early compaction. There was no way we would be able to dig it out with a garden fork. Thanks to the Instagram accounts of a few local farms, I got the idea of using our tractor and the ripper implement to lift the garlic out of the cement-like soil. Very carefully, Steven drove the tractor through the beds, with the ripper next to the rows of garlic, and it did the trick to loosen the soil and lift the garlic out. We still had to do some digging, but it made it possible. The harvest was quite good, given the planting dates and soil conditions. 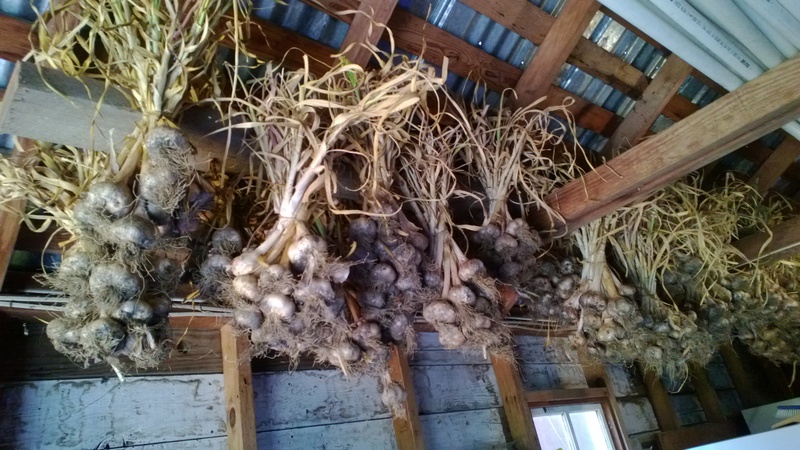 We put the garlic in the shop to cure, some hanging in bunches, some out on a drying rack. And now, it has dried down and is ready to enjoy. July ended with my annual inspection for organic certification. My Oregon Tilth Certified Organic inspector came out for nearly half a day and spent time with me, going over the details of my organic system plan, discussing a few minor changes and looking at my records. 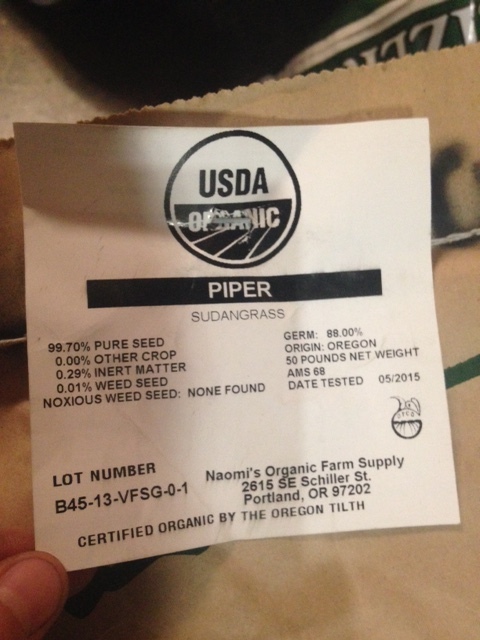 The records are the big thing…did I really buy and use organic seed and fertilizers? (Save and show the receipts, invoices, labels and packages.) What about my harvest and sales records? (Show my record keeping system and make sure it could be audited.) After that, we took a tour of the farm: storage areas, fields, hoop houses; just making sure it all fits together. It was a good day. I was happy to show the inspector what I was doing and happy that you can be sure of what I am doing…that someone is checking up on me. Maybe some certified organic pepper starts? thanks for sharing the process! 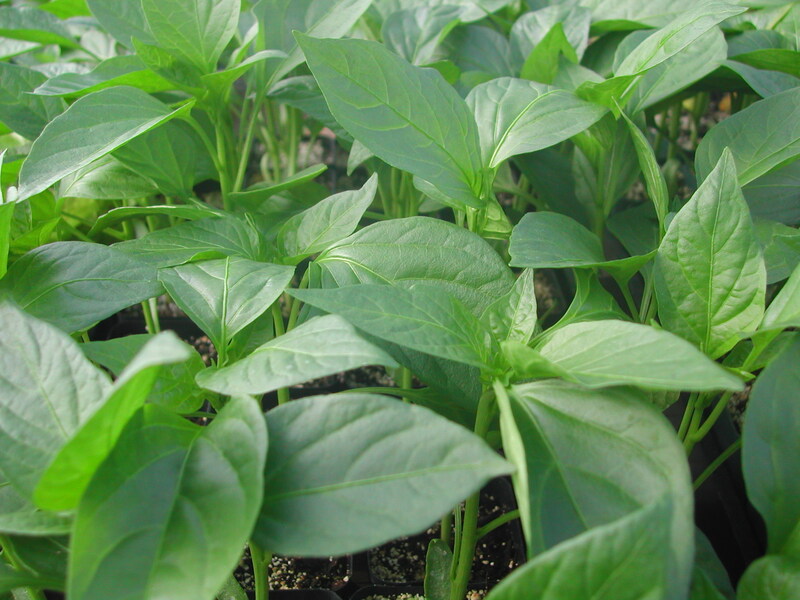 Will you be able to sell starts with the CSA deliveries?